There is one true life form. There is no other. It is disparate and separate. It spreads itself through the vast gulfs of space. We were not here when it began to feed on ours. It is why we are here. When the organic matter of its preplasmic mass first impacted our cooling lithosphere it was the catalyst for the long series of reactions and accidents that led to cellular life. It sustains itself on the nickel-iron warmth and rich silicates inside our planet, growing and growing to the slow heartbeat of geological time. And smeared upon the planet's thin crust we grew from the organic detritus it left behind, oozing out of the oceans beneath the eerie light of the moon thrown free by its impact. It has been growing for a very very long time. The time of planetary lysis draws near. It's dead easy to Lovecraftify something by just slapping some tentacles on it, describing it as "squamous" and tacking on some sanity mechanics. Now it's Lovecraft! 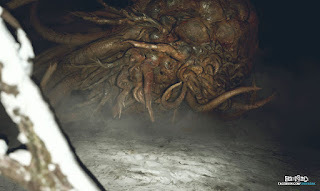 It's not horrific because it's scary looking and will kill you, it's horrific because you've found out that the lives and works of everyone and everything you know are meaningless against the impersonal march of time, that everything to which you ascribe meaning is truly inconsequential. Our existence changes nothing. Arnold's already talked about this here so I won't harp on further. This is my ultimate truth of the world. I called it Shub-Niggurath in my notes but to my players it won't have a name. It's not something that has one name, if it has a name at all. It just is. Shub-Niggurath is a great lifeform. It has the intelligence of an amoeba. When it is ready to reproduce it induces the destruction of the host planet, riding the ruptured rock outwards such that some few of the protoplasmic pieces of itself will impact suitable planets and continue the process. It is an intergalactic disease, destroying solar systems on timescales that are meaningless to us. Panspermia is an uncommon side effect of its life cycle. Sometimes the timing and conditions are right to catalyse life on a host planet. Very rarely this life survives to thrive and evolve as we have done. We are elevated pond scum clinging to the crust as it grows below us, uncaring and unheeding and incapable of either. One day soon it will crack the world open and begin the next stage of its life cycle. It will destroy us forever without knowing that it did so. Indeed, it has not the capacity to care.